Neil Cawthorne - Grey mare with foal, 1970 - Online gallery supplying original fine art. Trending Modern British and Contemporary Welsh. Available for sale from Big Sky Fine Art; this original oil painting by Neil Cawthorne dated 1970.<br> The painting is presented and supplied in a sympathetic contemporary frame.<br> The painting is signed lower right.<br> <br> Neil Cawthorne was born in Leicestershire and is a highly esteemed equestrian artist, specialising in hunting, racing and polo scenes. He helped to found the Society of Equestrian Artists in 1979. He has exhibited with the American Academy of Equine Art and at the Society of Equestrian Artists’ annual exhibition at Christies where he has won numerous awards.<br> His works are much sought after and he is fully employed with commission work. His paintings appear in the private collections of HRH the Prince of Wales, the Duke of Beaufort, Lord Harrington and Lord Vesty. Several of his paintings have been produced as limited edition prints and a number have been used by charities as Christmas cards.<br> When not painting he indulges his love of horses by hunting and racing. He has held an Amateur licence and has owned a number of racehorses.<br> <br> This original painting depicts a pale grey mare, and her brown foal, running alongside each other in perfect harmony. This is a masterclass in movement, light and shadow by one of the leading equestrian artists. The horses run on sweet green grass, with a wooden picket fence behind and the mixed greenery of trees or woodland in the background. The palette, as well as the age of the foal, suggests it is springtime and the overall mood is positive, maternal, life affirming. Available for sale from Big Sky Fine Art; this original oil painting by Neil Cawthorne dated 1970. The painting is presented and supplied in a sympathetic contemporary frame. Neil Cawthorne was born in Leicestershire and is a highly esteemed equestrian artist, specialising in hunting, racing and polo scenes. He helped to found the Society of Equestrian Artists in 1979. He has exhibited with the American Academy of Equine Art and at the Society of Equestrian Artists’ annual exhibition at Christies where he has won numerous awards. His works are much sought after and he is fully employed with commission work. His paintings appear in the private collections of HRH the Prince of Wales, the Duke of Beaufort, Lord Harrington and Lord Vesty. Several of his paintings have been produced as limited edition prints and a number have been used by charities as Christmas cards. When not painting he indulges his love of horses by hunting and racing. He has held an Amateur licence and has owned a number of racehorses. 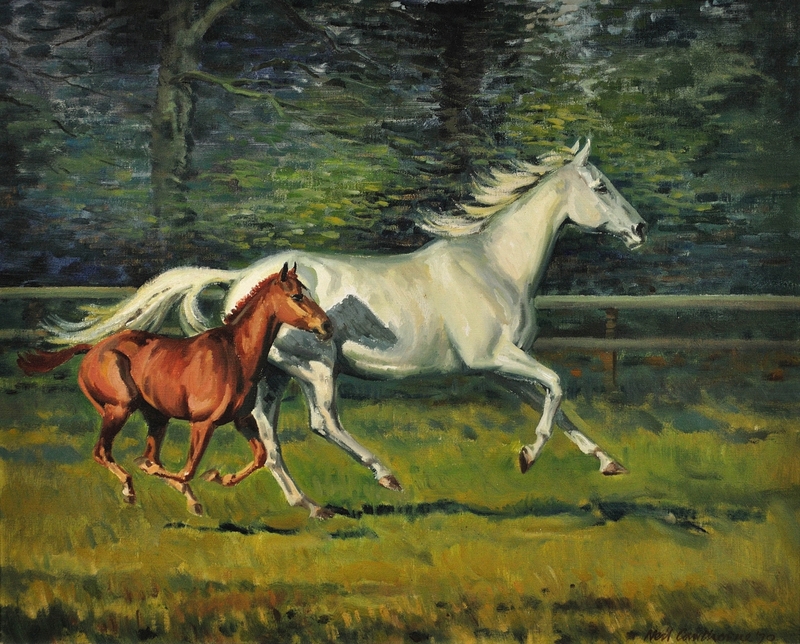 This original painting depicts a pale grey mare, and her brown foal, running alongside each other in perfect harmony. This is a masterclass in movement, light and shadow by one of the leading equestrian artists. The horses run on sweet green grass, with a wooden picket fence behind and the mixed greenery of trees or woodland in the background. The palette, as well as the age of the foal, suggests it is springtime and the overall mood is positive, maternal, life affirming.